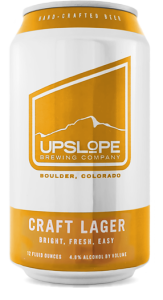 Boulder, Colorado-based Upslope Brewing features a wide variety of beers, including a Thai White IPA (yum), a Blood Orange Saison, and, this being Colorado, a 10% ABV Imperial India Pale Ale, which packs a wallop for you hopsheads. I sampled the Craft Lager, which is a mild, easy-drinking, laid back beer. Upslope donates 1% of its proceeds from its Craft Lager to TU chapters in the Boulder area. It’s a perfect fishing beer, and you have to a dmire that. My single criticism of the craft beer movement is that a lot of the time craft brewers get carrier away — they work so hard to whip up something different, they forget that it still needs to be *good*. This beer is better than good, and it does good too. Although currently limited to distribution in the Mountain West, this beer will be there on your next trip to the Rockies — be sure to sink a few before chasing the evening rise. * I am happy to be proven wrong.